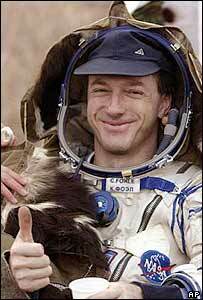 Foale: "Landing was surprisingly soft"
Russia's Soyuz capsule with three crewmen from the International Space Station has landed in Kazakhstan. The capsule touched down safely at 0011 GMT, Russia's mission control centre in Korolyov, outside Moscow, reported. Russian Alexander Kaleri and British-born Michael Foale have been in space for six months; Dutchman Andre Kuipers returns with them from an 11-day stint. The Soyuz craft has taken over trips to and from the space station, after the Columbia shuttle disaster last year. American astronaut Michael Fincke and Russia's Gennady Padalka will remain behind to man the space station, having arrived there on 21 April. "It was a soft landing," a spokesman at Korolyov was quoted as saying by Reuters news agency. "It was right on the money, almost a bull's eye landing for Soyuz," said Nasa spokesman Robert Navias at the landing site near the city of Arkalyk, in northern Kazakhstan. 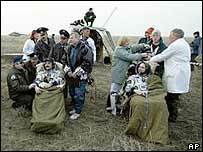 Russia's ground recovery teams pulled the crew out of the charred capsule and allowed them to relax in reclining chairs before conducting the mandatory medical checks. "This is tea, not cognac," said Foale, as he was drinking from a plastic cup. 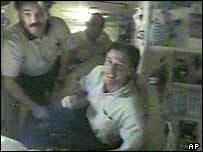 "It all went off very smoothly and the landing was surprisingly soft," the astronaut added. Several hours earlier - at 2052 GMT - the trio's craft began its return to Earth by disengaging from the ISS. The operation to recover the capsule involved 160 people, as well as eight helicopters, two aircraft and two all-terrain vehicles. On Wednesday, Russian officials said the Soyuz was leaking helium. But both they and their American colleagues said the leak was minor and would not affect the landing. Russian officials also managed to avoid a repeat of events last May, when the returning capsule had to be hunted for several hours after slipping off course on its way down. The International Space Station project involves 16 nations. The US space shuttle fleet, which used to serve the station, has been grounded since February 2003, when the Columbia orbiter burnt up on re-entering the atmosphere, killing all seven astronauts aboard it. The Russians, having taken over the work of carrying crew and equipment to and from the station, are calling for astronauts to double their tour of duty aboard the station to a year. But the Americans have vetoed this, saying security and training for the astronauts needs to be improved first. It is probable that Nasa will agree to the request eventually, however. "They landed right on target"